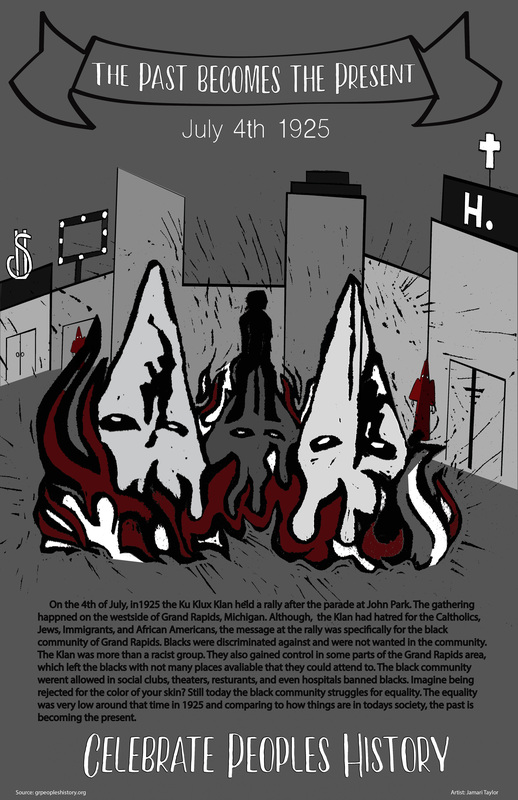 A new print by Jamari Taylor, depicts the blatant display of White Supremacy in Grand Rapids in 1925, when the KKK organized a parade on the city’s westside. This new artwork communicates a powerful message about the Klan, which turned out 3,000 members who marched down Bridge St and ended up at John Ball Park. The print includes text taken from the original posting from this site, but what makes it so powerful is that the buildings in the background of the print are situated in contemporary downtown Grand Rapids. You can see the Amway Grand Plaza Hotel, what appears to be St. Mary’s hospital and another building with a dollar sign above it. The dollar sign could easily represent the amount of money that white investors and developers have spent to “revise” the downtown area, to the exclusion of African Americans and other communities of color. The print keeps the traditional hooded white robes images, but makes the connection between 1925 and 2018, showing that white supremacy and institutionalized racism continues to dominate the city. This entry was posted in Civil Rights/Freedom Movement, People's History Artwork and tagged 1925 Klan rally in Grand Rapids, white investment and development in Grand Rapids, white supremacy in Grand Rapids. Bookmark the permalink.